Foundation is the lower part of structure that transmit structural load to the earth safely. It is very common to place foundation below ground surface. We have published a post providing requirements of placement depth of foundation. So in this post we will not discussed this fact. An excavation of soil is required to reach base level of foundation. Sometimes more depth is required where one/more stabilization layer/layers is/are provided to reach desired bearing capacity. The stabilization is required where heavy structures are required to be founded at shallow depth. B. 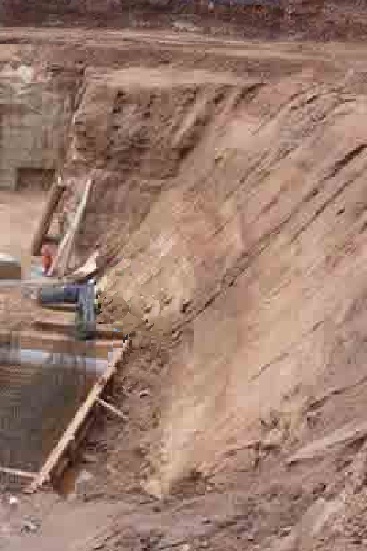 Having adequate space to provide stable slope for excavated soil. E. Weather and climatic condition. F. Duration to stabilize the excavation either by providing foundation and back filling or providing some support to slope. Previous experiences conclude that the critical slope of excavations is determined by permitting few/some sliding usually not serious to be failure of slope. This also a fact that the removal of sliding excavation materials should not be greater than the materials to be excavated further to provide a flatter slope not to be occurred failure. For convenience of understanding unsupported excavation requirements, we will publish posts for both sandy and clayey soil. Please stay with us. In the world of construction and development, there are so many tasks that are needed to be accomplished. Excavation is one of these tasks.